Mogadishu (ANN)-As Mogadishu is concentrating more and more on dismantling the unified Somaliland pursuit of sovereignty restoring an independence the nation sacrificed for a ‘Greater Somalia’ cause in 1960, 3 ex-members of the Somaliland Cabinet of Ministers alight in Mogadishu. A Somaliland newspaper, Geeska Afrika, reported, Tuesday, that two deputy ministers and a former Minister of State, have arrived in Mogadishu of the Somalia Federal Government, the only – and avowed – opponent of the Somaliland case. The outlet, as reported, tried to reach Ahmed Ismail ‘Keise’, a Deputy minister at Planning, and Khadar Ahmed Derie, a State Minister at Justice until to the very end of the former government under President Ahmed Mohamed Mohamoud ‘Siilaanyo’, but to no avail. Ahmed Keise also served as a Deputy Minister under ex-president Dahir Rayale Kahin and his UDUB party before that government handed leadership over to Kulmiye in 2010. Both Keise and Khadar have not, also, tendered any resignation to the Central Council membership of the ruling party – Kulmiye – as far as known reports indicate. The former has flitted in and out of all three national political parties of Somaliland: UDUB, UCID, and Kulmiye – in this order. The third, Hassan Dahir Dhimbil, served as deputy Minister both under UDUB and Kulmiye governments. 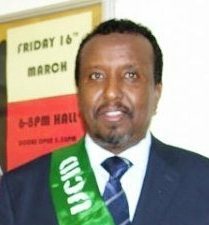 He has joined the Central Committee of Waddani national political party after being relieved of his duties by identifying himself with Ex-Presidency minister Hersi who led over 20 top officials out of government in 2014 in protest of incumbent President’s nomination to lead the party’s bid for the highest post in the 2017 presidential elections. Mogadishu has often been accused of actively setting aside a lush, unaccountable fund called disburso or fondo politico (Political disbursement or fund) in Mogadishu for the express purpose of sabotaging Somaliland national unity and the pursuit of the independence it restored in 1991, blocking every effort to gain international, diplomatic recognition. Taking advantage of world that balks at challenging the legitimacy of claims over Somaliland and the pseudo-representation of a senior partner in the 1960 union, Villa Somalia has gathered a number of disgruntled elements to ‘represent Somaliland’ in the ministerial cabinet, and in both the Lower and Upper houses of the Somalia parliament. A Somalilander has been named to the post of Chief Justice twice to continue the charade of representation for the benefit of the international community that keep Villa Somalia running. The Deputy Prime Minister, Mahdi Mohamed Guleid ‘Khadar’ (above), of late, is said to be masterminding the Somaliland fragmentation and infiltration operations of its society by devising schemes such as the Re-integration of Somali Society and sustained pressure on Somaliland using a number of influencers to earn sympathy and support for another Somaliweyn (Greater Somalia) reunification. The sustained, make-belief jurisdiction over Somalia on the part of Somalia is one of the major hindrances to an amicable settlement between the two erstwhile partners in the 60 Somali Republic, political analysts identified. Somaliland has never agreed to an entity called ‘Somalia’ as Villa Somalia is erroneously feeding a world not so confident on its history lessons, and the Somali Republic was dissolved by General Siad Barre’s coup d’tat in 1969.